Queen Amina is described as a legend and represents the spirit and strength of womanhood. Amina was the elder daughter of Queen Bakwa Turunku, the founder of the ZauZau kingdom, now modern-day Zaria. Her family’s wealth is said to come from the sale of leather goods, cloth, kola, salt, horses and imported metals. After her mother died in 1566, Amina’s younger brother, Karama was crowned king while Amina learned more and sharpened her military skills from the warriors of the Zazzau. By the time her brother died after a ten-year rule, Amina had grown into a fierce warrior earned the respect of the Zazzau military and then became the ruler of the kingdom. Three months after she gained power, Amina led her first military warfare. In her 34 year reign, she fought and expanded her kingdom to the greatest in history. She initiated so many battles because she wanted neighboring rulers to support and permit her traders’ safe passage, by this; she boosted her kingdom’s wealth and power with gold, slaves, and new crops. The lands of Katsina and Kano were forced to hand over levy to her. She also invaded the lands of Bauchi until she reached the Atlantic Ocean to the south and west. 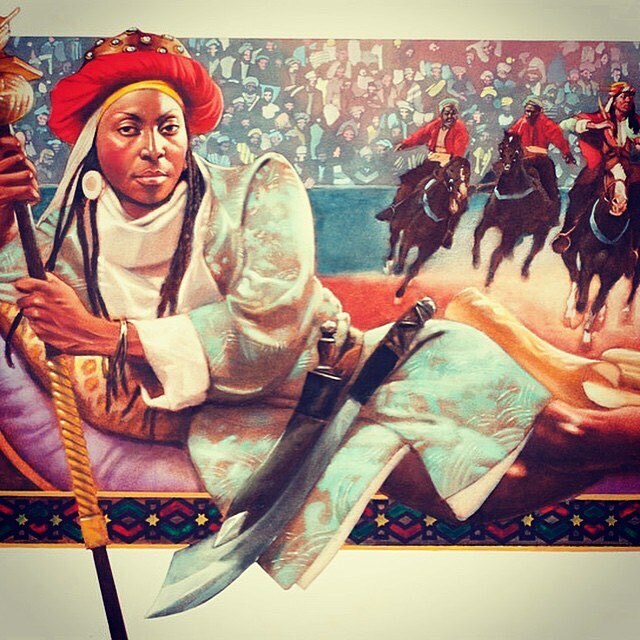 She conquered as far as Nupe and Kwarafa. Because her people were talented metal workers, Amina introduced metal armor, including iron helmets and chain mail, to her army. Amina created earthen walls to fortify each of her military camps. The walls became the prototype for the fortifications used in all Hausa land. These fortifications became known as ‘Ganuwar Amina’ or Amina’s walls. History explained that Amina never had children as she refused to marry so as not to lose power to a man. Instead, she takes a temporary husband from the conquered people after each battle. After spending the night together, she condemns them to death the following day to prevent them from speaking about their sexual encounter with her. Queen Amina controlled the trade routes in the region, erecting a network of commerce within the great earthen walls that surrounded Hausa cities within her dominion. Queen Amina died in a place called Attaagar. The Queen Amina Statue at the National Arts Theatre in Lagos State honors her, and multiple educational institutions bear her name.